“Anything I kind of touch, magically becomes delicious,” Chef Lance Roll. One of Chef Lance’s main mentors continues to be holistic health practitioner, friend and guru, Paul Chek (http://chekinstitute.com/). While he catered retreats for the Chek Institute, Chef Lance says that, “Paul Chek helped to develop me both personally and spiritually.” He emphasized that Chek taught him not only meditation and the meaning of happiness, but what it meant to be, “more involved with the Earth and what comes from the Earth, which is food, for me.” He also credits Chek as one of the forefront drivers of the real food movement. Chek, in his book, “How to Eat, Move and Be Healthy,” teaches us to turn away from modern processed foods, in favor of organic foods. Chef Lance described it as a return, for him, to his roots, growing up on Long Island, where he had an organic garden and traditional European style meals, cooked by his mom using whole foods. “Process food has taken over, and you know the health of America hasn’t gotten any better,” Chef Lance Roll. 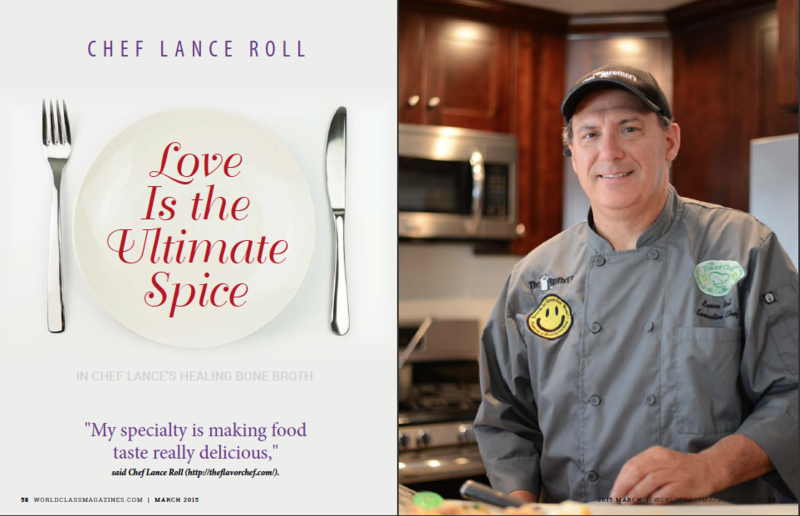 In 2006, Chef Lance first learned about the healing benefits of bone broth from Sally Fallon Morell’s book, “Nourishing Traditions,” of the Weston A. Price Foundation. (http://www.westonaprice.org). Chef Lance explained that good chefs everywhere make stock and broth, but few of them know how truly good it is for people, “until now, with the Broth Food trend of 2015.” Adding that, “In Chinese medicine, in Asian cultures, and around the globe traditional cooking includes the daily making of bone broth soups. These broths come from animal bones, fish, vegetables and mushrooms. There is a need in these cultures to find resourceful ways to increase the nutrient density of foods while being frugal and wasting nothing.” Sadly, such soups have been recently pushed aside by processed products that are very convenient, but do not, “even come close,” in terms of health or flavor. In 2007 (11/11/2007), Chef Lance, had an authentic vision from God to bring his broth product to the marketplace. He registered the slogan, “Broth is good for you . . . promotes a healthier you,” in 2008. This is very significant, as Chef Lance was a full seven years ahead of the national and international food trend! 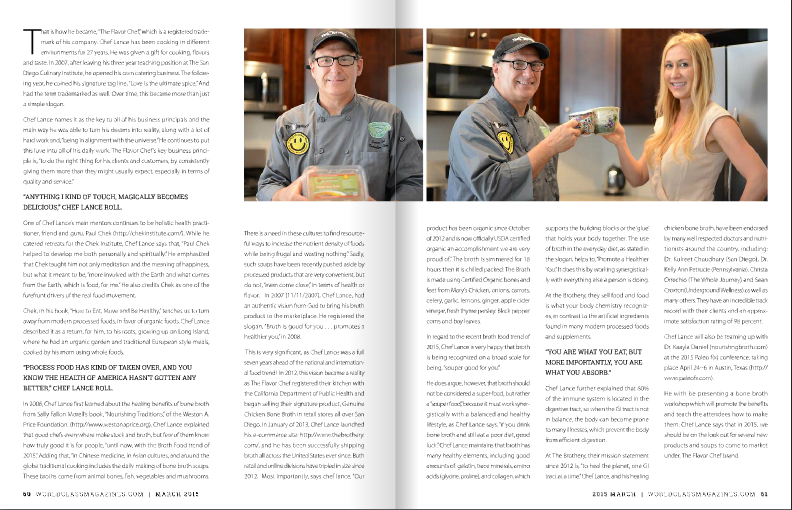 In 2012, this vision became a reality as The Flavor Chef registered their kitchen with the California Department of Public Health and began selling their signature product, Genuine Chicken Bone Broth in retail stores all over San Diego. In January of 2013, Chef Lance launched his e-commerce site: http://www.thebrothery.com/, and he has been successfully shipping broth all across the United States ever since. Both retail and online divisions have tripled in size since 2012. Most importantly, says chef lance, “Our product has been organic since October of 2012 and is now officially USDA certified organic an accomplishment we are very proud of.” The broth is simmered for 18 hours then it is chilled packed: The Broth is made using Certified Organic bones and feet from Mary’s Chicken, onions, carrots, celery, garlic, lemons, ginger, apple cider vinegar, fresh thyme parsley. Black pepper corns and bay leaves. In regard to the recent broth food trend of 2015, Chef Lance is very happy that broth is being recognized on a broad scale for being, “souper good for you.” He does argue, however, that broth should not be considered a super-food, but rather a “souper food,” because it must work synergistically with a balanced and healthy lifestyle, as Chef Lance says, “if you drink bone broth and still eat a poor diet, good luck.” Chef Lance maintains that broth has many healthy elements, including good amounts of: gelatin, trace minerals, amino acids (glycine, proline), and collagen, which supports the building blocks or the ‘glue’ that holds your body together. The use of broth in the everyday diet, as stated in the slogan, helps to, “Promote a Healthier You.” It does this by working synergistically with everything else a person is doing. At the Brothery, they sell food and food is what your body chemistry recognizes, in contrast to the artificial ingredients found in many modern processed foods and supplements. Chef Lance further explained that 80% of the immune system is located in the digestive tract, so when the GI tract is not in balance, the body can become prone to many illnesses, which prevent the body from efficient digestion. 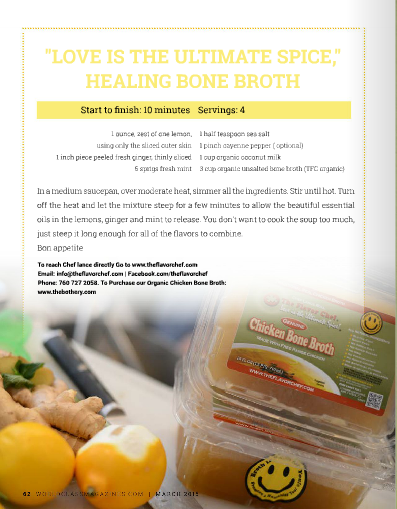 At The Brothery, their mission statement since 2012 is, “to heal the planet, one GI tract at a time.” Chef Lance, and his healing chicken bone broth, have been endorsed by many well respected doctors and nutritionists around the country, including: Dr. Kulreet Chaudhary (San Diego), Dr. Kelly Ann Petrucie (Pennsylvania), Christa Orrechio (The Whole Journey) and Sean Croxton(Underground Wellness) as well as many others. They have an incredible track record with their clients and an approximate satisfaction rating of 98 percent. In a medium saucepan, over moderate heat, simmer all the ingredients. Stir until hot. Turn off the heat and let the mixture steep for a few minutes to allow the beautiful essential oils in the lemons, ginger and mint to release. You don’t want to cook the soup too much, just steep it long enough for all of the flavors to combine.